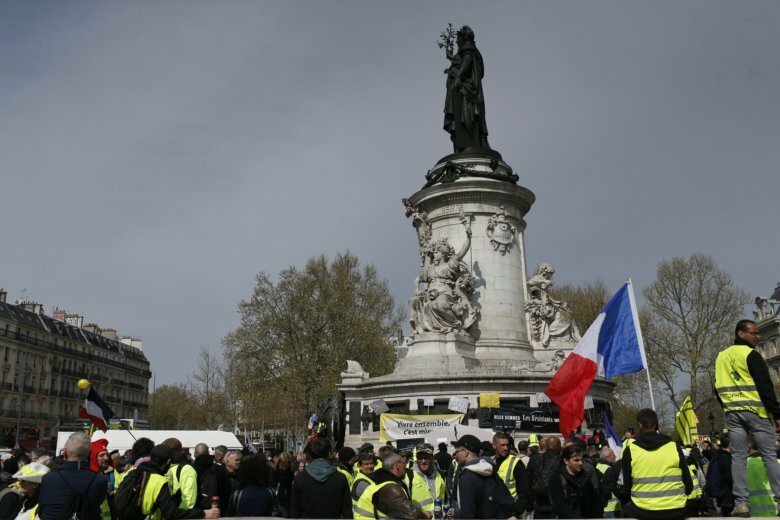 PARIS (AP) — A dwindling number of protesters marched through the streets of France for the yellow vest movement’s 21st straight weekend of demonstrations Saturday, with thousands of people crisscrossing Paris and a group that briefly invaded the busy beltway around the city making their presence known. Riot police rounded up the protesters on the beltway and fired a round of tear gas on the street above, apparently to stop others from entering a ramp onto the road. At another of Saturday’s numerous protests around the country, police fired tear gas in Rouen, in Normandy, in a showdown with protesters after fires were set in garbage cans and elsewhere. The Interior Ministry counted 22,300 participants nationwide and 3,500 in Paris, French media reported. Those were the lowest numbers since the yellow vest protests started on Nov. 17. The movement routinely contests the government’s protest attendance figures. The number of people taking part in the yellow vest demonstrations has been falling since the first protests over fuel hikes drew hundreds of thousands of people. But the leaderless grassroots movement for social and economic justice continues to pose a challenge for French President Emmanuel Macron. Macron organized a national debate, started in January, to respond to concerns about sinking living standards, stagnant wages and high unemployment aired at the demonstrations. Prime Minister Edouard Philippe is to provide an initial recap Monday, before addressing parliament. Proposals growing out of the numerous meetings were expected later. The movement got its name because protesters wear the fluorescent safety vests motorists are required to carry in France. The vests initially symbolized frustration over fuel tax increases Macron ordered — and since withdrew — as a disincentive to drivers, an action intended to curb climate change. The movement’s demands have since multiplied to include, for instance, a people’s referendum and restoration of a wealth tax, with increasing buying power a bottom line. Paris police, meanwhile, have fine-tuned their strategy to make officers more mobile and more proactive in countering rowdy protesters. A new police chief was appointed. Last month, rioters set life-threatening fires, ransacked luxury stores and rioted around Champs-Elysees Avenue, famed for its high-end shops. The Champs-Elysees has since been declared off-limits to protesters. One prominent figure in the movement, Eric Drouet, was among a half-dozen protesters stopped in the prohibited area and issued a fine he plans to contest, Drouet’s lawyer, Kheops Lara, told French television channel LCI. In Paris, protesters marched on Saturday from the Place de la Republique in the east to the business district, La Defense, on the capital’s western edge. The finishing point was chosen because of its significance in the world of finance, Drouet said. The yellow vest movement “hasn’t stopped at all,” Drouet told LCI. Meanwhile, France’s Constitutional Council vetoed on Thursday a measure backed by Macron’s government to prevent violence during protests. The law was not proposed as an outgrowth of the yellow vest protests. The Constitutional Council struck down provisions authorizing regional prefects to ban people from demonstrations if they’re considered a serious threat to public order. The council ruled that would give authorities “excessive latitude” and infringe on freedom of expression. But it approved other parts of the law — not yet in force. One broadens the circumstances under which police can search protesters’ bags and vehicles. The other makes it a crime for protesters to conceal their faces, with convictions punishable by up to one year in prison and a 15,000-euro ($17,000) fine. Chris Den Hond and Sylvie Corbet in Paris contributed to this report.